The ACR has joined the American Board of Internal Medicine-led Choosing Wisely campaign to reduce unnecessary care, lower patient dose, and help curb healthcare costs. In April, the ABIM Foundation released a list of 45 tests and procedures that it wants physicians to at least question before ordering. The list was compiled by nine medical specialty societies, including the ACR, each of which contributed five tests to this list. The list, announced with much fanfare, is part of the ABIM Foundation’s Choosing Wisely campaign, which is designed to help lower healthcare costs by reducing unnecessary procedures. According to experts with the Congressional Budget Office, nearly one-third of healthcare spending goes toward tests and procedures that are unnecessary. The ACR was eager to participate in the Choosing Wisely campaign for two reasons, says Debra Monticciolo, MD, FACR, vice chair of the ACR Commission on Quality and Safety and vice chair of research in the radiology department at Texas A&M University. “First, we think it’s a great idea to use imaging more effectively and, second, it’s an extension of our own efforts to educate physicians on the best use of imaging and our own quality and safety programs. So it fit in very nicely with things we were already doing,” she explains. The ACR joined the project in December 2011 without any hesitation, she adds. A 2010 article in The New England Journal of Medicine written by medical ethicist Howard Brody, MD, PhD, sparked the Choosing Wisely campaign. In the article, he called on physicians to think about five tests or procedures that are overused, says Daniel Wolfson, executive vice president and chief operating officer for the ABIM Foundation in Philadelphia. Brody’s article prompted the National Physicians Alliance, through an ABIM Foundation grant, to publish lists of tests and procedures in internal medicine, family medicine, and pediatrics that are overused. “It seemed to be a natural evolution that we would take the project that the National Physicians Alliance started and expand it to specialty societies,” Wolfson says. 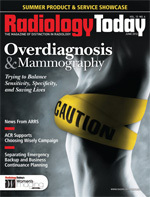 The ACR was invited to participate in compiling the initial list because, as Wolfson explains, “we had a relationship with them and this aligned with its Image Wisely campaign.” Launched in November 2010, the Image Wisely campaign is a collaborative initiative of the ACR, RSNA, the American Society of Radiologic Technologists, and the American Association of Physicists in Medicine that encourages imaging providers to ensure patients receive only necessary scans and to reduce the radiation dose used in those exams. Each organization that participated in the Choosing Wisely project was asked by the ABIM Foundation to identify its own “unnecessary” five tests or procedures. “They gave us instruction to get us started,” Monticciolo explains. “They wanted tests that we thought, based on our own experience and expertise, are likely overutilized. They gave us free range to choose what we wanted.” The only caveat was that the choices had to be evidence based and could be presented in short, clear statements. The ACR formed a committee to make its list. “We wanted to make sure the members represented different subspecialties within radiology,” says Monticciolo, a breast imager. The committee was able to easily pare down the list to seven tests. However, trimming it to five was a little more difficult, Monticciolo says. “We wanted to pick things that are commonly used. We also tried to include different areas,” she explains. Eventually, the committee members agreed on the five they thought would have the most impact. 5. follow-up imaging in reproductive-age women for adnexal (reproductive tract) cysts 5 cm or less in diameter. Wolfson says one reason the ABIM Foundation partnered with Consumer Reports on the project was to get the public’s attention, and it’s working. “People have told us this is a refreshing conversation to have,” he says. Monticciolo notes that it’s difficult to change physicians’ common practices. Consider imaging for uncomplicated headaches, for example. “It stresses uncomplicated—there is no structural signs or evidence of disease. It’s just a straightforward headache,” she says. “When CT first came out, it was an exciting thing to see the detail and how much it could help make diagnoses. But not everybody with a headache needs a head CT, and it does come with some risk to the patient. It’s small, but it’s there. We’re trying to change a pattern that maybe got established because it’s exciting to have new technology, but once we establish what that technology can or can’t do for a patient, you make a different decision.” There may be other reasons a patient needs a CT, but if not, save the radiation exposure and time if it’s not going to help, Monticciolo says. Overall, the use of medical imaging has declined since 2008, Monticciolo notes. “But we still feel there are opportunities to ensure appropriate imaging in some areas, and that’s what this list is about,” she adds. The other eight societies that participated in the initial list are the American Academy of Allergy, Asthma & Immunology; the American Academy of Family Physicians; the American College of Cardiology; the American College of Physicians; the American Gastroenterological Association; the American Society of Clinical Oncology; the American Society of Nephrology; and the American Society of Nuclear Cardiology. The second round will unveil their respective lists in the fall. “The second round will be bigger than the first,” Wolfson says. SNM is among those participating in the second round, along with the American Academy of Hospice and Palliative Medicine, the American Academy of Otolaryngology–Head and Neck Surgery, the American College of Rheumatology, the American Geriatrics Society, the American Society for Clinical Pathology, the American Society of Echocardiography, and the Society of Hospital Medicine. 1. Don’t do imaging for uncomplicated headache. Imaging headache patients absent specific risk factors for structural disease is not likely to change management or improve outcome. Patients with a significant likelihood of structural disease requiring immediate attention are detected by clinical screenings that have been validated in many settings. Many studies and clinical practice guidelines concur. Also, incidental findings lead to additional medical procedures and expense that do not improve patient well-being. 2. Don’t image for suspected pulmonary embolism (PE) without moderate or high pretest probability. While deep vein thrombosis and PE are relatively common clinically, they are rare in the absence of elevated blood D-dimer levels and certain specific risk factors. Imaging, particularly CT pulmonary angiography, is a rapid, accurate, and widely available test but has limited value in patients who are very unlikely, based on serum and clinical criteria, to have PE. Imaging is helpful to confirm or exclude PE only for such patients, not for patients with low pretest probability of PE. 3. Avoid admission or preoperative chest X-rays for ambulatory patients with unremarkable history and physical exam. Performing routine admission or preoperative chest X-rays is not recommended for ambulatory patients without specific reasons suggested by the history and/or physical examination findings. Only 2% of such images lead to a change in management. Obtaining a chest radiograph is reasonable if acute cardiopulmonary disease is suspected or there is a history of chronic stable cardiopulmonary disease in a patient older than the age of 70 who has not had chest radiography within six months. 4. Don’t perform CT for the evaluation of suspected appendicitis in children until after ultrasound has been considered as an option. Although CT is accurate in the evaluation of suspected appendicitis in the pediatric population, ultrasound is nearly as good in experienced hands. Since ultrasound will reduce radiation exposure, ultrasound is the preferred initial consideration for imaging examination in children. If the results of the ultrasound exam are equivocal, it may be followed by CT. This approach is cost-effective, reduces potential radiation risks, and has excellent accuracy, with reported sensitivity and specificity of 94%. 5. Don’t recommend follow-up imaging for clinically inconsequential adnexal cysts. Simple and hemorrhagic cysts in women of reproductive age are almost always physiologic. Small simple cysts in postmenopausal women are common and clinically inconsequential. Ovarian cancer, while typically cystic, does not arise from these benign-appearing cysts. After a good-quality ultrasound in women of reproductive age, don’t recommend follow-up for a classic corpus luteum or simple cyst less than 5 cm in greatest diameter. Use 1 cm as a threshold for simple cysts in postmenopausal women.